I love photo combos like this. Ones of the same place, in this case, 60 years apart. BTW, YouTube has a surprising number of films to watch this year. Lindsay has been nice enough to let us have a couple of photos of the adult Virginia to round out the collection. She worked with Mickey four times. They had good on screen chemistry. I often say that Virginia was Mickey, but wanted to grow up to be Judy. The Virginia Weidler Remembrance Society received the completed proclamation from the City of Los Angeles declaring March 21 a "Celebration of Virginia Weidler." We are pretty excited. I've attached photos of my VWRS co-manager Danny Miller with the proclamation as well as photos of the text and signatures. We plan to offer it to the family. If they don't take it, I have a bare spot on my wall. The only problem is, sadly, she has no star. By the time the Walk started Virginia had already withdrawn from any connection to Hollywood. The story goes that Norman Taurog discovered Virginia when she was appearing in the play AUTUMN CROCUS at the El Capitan in Los Angeles. Virginia had already been in films, but the parts were all of the "seen and not heard" variety. Taurog then tested her for and cast her in MRS. WIGGS OF THE CABBAGE PATCH. Paramount would sign her long term after that film. A Danny Miller find. Mickey on Ginny! I was still trying in vain to get in touch with Mickey Rooney at the time of his death. Fortunately, he did talk about working with Virginia. VWRS West Coast Chief Danny Miller looked over THE ESSENTIAL MICKEY ROONEY By James L. Neibaur yesterday. This is a repost because I stupidly broke a rule the first time. First, I thank Top Billed for the wonderful interview in his thread and for thinking my project is worth talking about. Second, I want you to know that cinephiled.com's Danny Miller spent a day with classic child actor Marilyn Knowlden and when he puts up his entire article, I'll link to it. Now for a big plan in which I need YOUR help. Virginia's 90th birthday takes place on March 21, 2017 and I think it is time that someone other than the poor little VWRS takes note of it. Of course, I will once again ask TCM to show a movie for her birthday and host the celebration myself if they don't come through. But that just isn't enough. We need something bigger. That is why I took the initiative, on behalf of the Society, to write letters to two members of the Los Angeles City Council-Jose Huizar, who represents Eagle Rock and Mike Ronin, who represents Brentwood-to ask for some sort of proclamation from the city about Virginia on the 90th anniversary of her birth. I've also contacted a very helpful member of the Eagle Rock Neighborhood Council to see if they might assist. He asked for more information and said he needed to watch some of her films, a good sign. Now this is where you come in. Do you live in Los Angeles? If so, how about writing a letter to your councilmember supporting this idea? You can mention the letters I've already written and ask them to help. I am attaching a copy of one of my letters so you know what I told the councilmembers. Don't live in Los Angeles? Wait until I've heard from either Mr. Huizar or Mr. Ronin before joining in with the City Council contact. I don't want them to feel overwhelmed. Instead, if you belong to a film society or organization, or maybe you write a film blog, would you consider talking this up a bit? The more allies we have, the better. It would be wonderful to see some Hollywood groups step up, but I admit to having no contacts there. Finally, try to picture Virginia up there accepting her award on her day! If we can do this, I'm sure she will be doing just that somewhere. Feel free to help, but if not thank you for reading. Thank you to Top Billed for a wonderful interview and thank you to Hep Classic and Nick and Nora 34 for remembering me. I guess I should start visiting again. I have a new crazy idea I'm trying if anyone wants to help: getting the City of Los Angeles to recognize Virginia in some manner for what would have been her 90th birthday, March 21, 2017. The details are here. TB, I hope you don't mind my linking to my post. Gee, every time I post here I'm shocked at the amount of time since my last post. Today was Virginia Weidler's birthday. As usual, The Virginia Weidler Remembrance Society watched Ginny films, ate cottage cheese, and had an all around good time. The fact that there was a Ginny film on Watch TCM was a help to many members, I think. The most important tradition, though, is the annual road trip taken by young Charlie Miller and his father Danny (of cinephiled.com) to a house in which Virginia lived. This year, they went to Virginia's last home, designed by her brother-in-law William Krisel, a very well known architect whose work is studied in classrooms today. 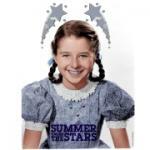 Here's Danny's account: Every year my son Charlie and I go to one of Virginia Weidler's homes in and around Los Angeles to pay tribute to the actress on her birthday. Last year we visited the Eagle Rock home where the Weidlers lived when Virginia was born. This morning we went to what was Ginny's home for the final 10 years of her life. Designed and built in 1959 by master architect William Krisel for his brother and sister-in-law, Lionel and Virginia, this gorgeous Mid-Century Modern house in Brentwood is in pristine condition today, and in spectacular surroundings at the end of a Hollywood Hills cul-de-sac in the shadow of the $1.3 billion Getty Center (which opened in 1997). The Krisels sold this home in 1975, seven years after Ginny's passing. Charlie enjoyed his annual birthday cottage cheese (Virginia's favorite snack) before we left instead of during our visit (I was a little worried about any questions from the Brentwood Police!) and we also shared a piece of birthday cake in Virginia's honor at one of of our favorite breakfast spots. Here's to you, Ginny! Congratulations TopBilled on reaching 20,000 posts! Gee, and I thought I had done alright by getting to near 2000 posts! Congrats! Whenever Sanders is in a film, I'm pretty sure I'm going to be entertained. Yes, he had major bouts while doing Father Knows Best. From things I've read, the children from that show said they didn't have much contact with him between scenes, while they were close to Jane Wyatt. He was in a much better "place" in his life when he played Marcus Welby, although depression did make a comeback when he was elderly.